Deborah McBain reflects on Episode 5, recalling her own experience with a Born Before Arrival birth. Editor’s Note: The opinions expressed in this blog post are solely those of the author. 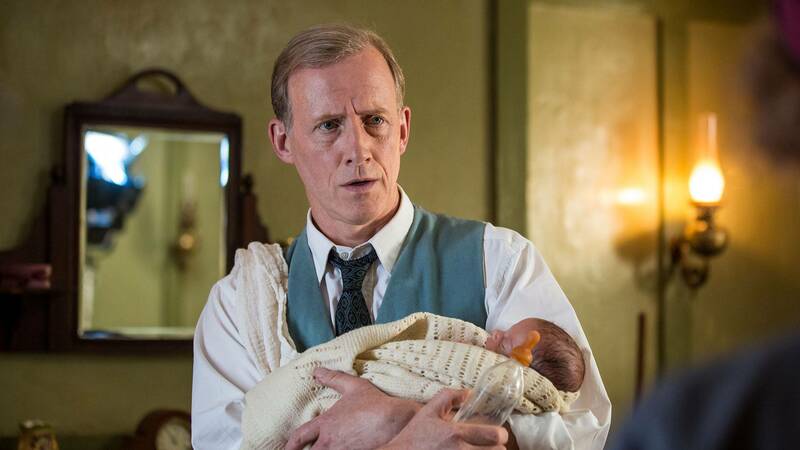 In the first four seasons of Call the Midwife the episode plots revolved around the midwives. Now, in Season 5, the midwives revolve around the plots. The themes are broader, wider and more “worldly.” As 1961 is a different world Call the Midwife is now a different program. This is not a criticism. Dealing with the scars of shame, repercussions of disease treatment and the importance of family support is not unexpected territory for the program. The realization of smoking as a real cause of lung cancer could not be ignored as an important marker of the times. I came of age during these times. I’m as confused about it now as I was then. As a person of a certain age I have my perspective. But as a midwife, what unique commentary do I have on these broad issues? I will leave it to historians, sociologists and politicians to comment on the big picture. Here I offer something smaller and more fun: a birth story about what our Poplar midwives call a Born Before Arrival (BBA). Today it is often called a precipitous delivery. Janet arrived in my suburban Detroit clinic on a warm summer afternoon for a routine prenatal visit. This was her third baby and first with a midwife. She was excited about her plan to have this baby at the Family Birth Center. The birth center was developed as an alternative to hospital birth. We prided ourselves in providing a home-like environment and supporting the normal process of labor and birth. This birth center was located in an office suite behind the main hospital. Separate but connected. For more information about birth centers go here. “I’ve been having contractions since this morning,” she reported to me in the hallway as she was escorted to an exam room. “OK, I’ll see you in a few minutes” I say as I enter the other exam room to see another patient. Literally in a few minutes I was with her as my assistant notified me that Janet’s water broke. She was already 7 cm dilated. We called an ambulance and soon we were on our way with lights flashing and sirens blaring. The young female ambulance attendants insisted that I sit in the front seat of the ambulance and not in back with Janet. “Going to be hard to catch a baby from the front seat," I said. “We will stop if delivery is imminent," assured the ambulance driver. They did seem grateful I was making the trip with them. So when Janet started grunting and calling my name just halfway to the birth center, we pulled over to the side of the busy expressway. I jumped out of the front seat and ran around to the rear of the ambulance. The doors swung open and while I kneeled just inside the vehicle, with Janet on a stretcher in front of me pushing, that eight-pound baby girl made her way into the world and into my waiting hands on the side of the expressway with dozens of cars rushing by. Janet’s privacy was protected but I often wonder what passers-by made of the scene. We were soon on our way again, with everyone arriving at the birth center safe and sound. Before we left the clinic we had notified Janet’s husband of the situation and he met us at the entrance of the building as we arrived. He was disappointed he missed seeing the birth of his daughter but relieved that all was well. I arranged for him to ceremonially cut the umbilical cord with the special scissors he had carefully prepared for the occasion. The family was taken to the birth center where they bonded and debriefed the experience. Later, my midwife partners teased me good-naturedly about starting a mobile birth center. That memorable birth bonded me to Janet and her baby for a while but eventually we lost touch. I hope they are well. That little girl would be a teenager now, maybe even learning to drive. Do you suppose that Motor City baby will be a race driver or will she hate cars? Maybe she arrives early to every event she attends. I think of her and wonder. And I wonder at the circumstances that brought Janet to me and I to her for that defining moment of her daughter’s momentous birth. Good stuff. Deborah McBain (CNM, MS, BSN, RN)Deborah McBain (CNM, MS, BSN, RN) is a nurse-midwife who has practiced in Metro Detroit for nearly 20 years. McBain received her Bachelor’s Degree in Nursing Science from Wayne State University-Detroit, Master’s Degree from the Case Western University-Cleveland and midwifery education through Frontier Nursing Service.